Week five has passed us by in the NCAA with little in the way of excitement, but provided us a stark contrast between the top teams in the Mid-American Conference and the bottom teams. Look no further than Northern Illinois to see just what a great MAC team can accomplish. This weekend, Northern Illinois went to Purdue for their second Big Ten match-up of the season after pulling out a 30-27 victory over Iowa in their first game. It was a match-up that featured a former MAC head coach taking on the team his Kent State Golden Flashes lost to in the MAC Championship last season. If you watched the game, you may have expected something great to happen. Northern Illinois has one of the worst defenses in the country and relies on their offense to pull out the shootout victories. Purdue should have been able to overpower them with their skill dominance over the Huskies. If you watched the game, though, you were treated to a different sight when the Huskies beat the Boilermakers in a 55-24 rout. This is significant because it’s the first time a MAC team has ever defeated two Big Ten schools in a single season. It also tied the largest margin of victory for a MAC school over a Big Ten program with Toledo’s 31-point win over Minnesota in 2001. Finally, it broke the MAC record for points scored over a Big Ten opponent, shattering the record of 41 set by Ball State last season at Indiana, all according to ESPN. If you needed any more reason to find this amazing, it was also a huge game for quarterback Jordan Lynch, but more on that later. Jordan Lynch of Northern Illinois. Photo by Chris Trotman/Getty Images. While we have such a great offensive force in the MAC from the Huskies, looking toward some other teams you could be confused. How is it that there’s a great offensive team like Northern Illinois in the same conference as two teams with 35 points or less through four games? Massachusetts may have an excuse, being that they’re early in their eligibility in the BCS and still learning the ropes and rebuilding their team with higher level recruits. The bigger anomaly is the “rival” of the Ohio Bobcats, the Miami (OH) RedHawks. This weekend saw the RedHawks do battle with Illinois, and it was gruesome. Illinois racked up the points on them en route to a 50-14 victory, but at least Miami can look at the bright side. They produced 104 yards in the first half, and 250 total in the game – both are season highs. This brings their yards per game average for the season to 174.5, a full 84 yard difference between them and the next worst team in the conference, Massachusetts, and 150 yards from the 11th ranked offense in the MAC, Buffalo, according to ESPN. Oof. Now that is bad. It seems like the MAC is giving some real separation from the very good in Northern Illinois or Bowling Green to the very bad in Miami. At least we’re a quarter of the way through the season, so those fans can’t suffer too much longer. For now, sit back and relax while we look at the big performers this week. 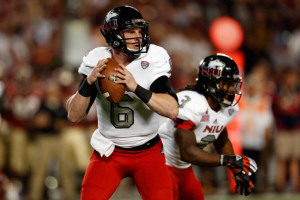 Offensive Player of the Week: Jordan Lynch, QB, Northern Illinois. I mentioned earlier that it was a big weekend for him. He went 18 for 25 for 207 yards and three touchdowns in the air, while carrying it nine times for 35 yards and a touchdown. Those totals helped to pull the senior superstar into the ranks of the elite, becoming the 26th player in FBS history to accrue 4,000 yards passing and 2,000 yards rushing in their career. It was a huge weekend for Lynch and company, and only helps build momentum heading into conference play this weekend. Defensive Player of the Week: Jimmie Ward, S, Northern Illinois. The Huskies were too dominant this weekend. Ward was a big factor in their victory as well. With Northern Illinois up 34-10 just starting the second half, Ward jumped the curl route and held his feet in bounds before taking his only interception of the game 62 yards for a touchdown. He also managed a pass deflection and nine total tackles in the game. He was a totally dominant force for the Huskies this weekend helping to give them such a large margin of victory. Goat of the Week: Miami (OH) RedHawks. Can I make this point any clearer? They were absolutely terrible in this game, only scoring against the back-up squad late in the third quarter and early in the fourth. They found themselves down 36-0 at the half, and that’s when Illinois finally let up on them. If a team doesn’t need to be competitive in the second half against you, there was a big failure by the entire team. They allowed 601 yards by the Illini, featuring 6.7 yards per rush and 9.5 yards per pass. On the bright side, they produced the most yards they’ve had all season and forced two turnovers… Yeah I agree, the bright side is still pretty dim. Game of the Week: Toledo at Ball State. While Northern Illinois was absolutely incredible, the fact we had MAC competition this week was truly exciting. It was made even better by the teams both producing over 400 yards of offense. If that wasn’t enough to convince you, they were back-and-forth all day long until finally Ball State’s Jahwan Edwards got the winning score on a four-yard run with just three minutes remaining. Down to the wire and explosive – this is what the MAC was meant to be. Games to Watch: Next week is a huge week in the MAC, as conference play is finally in full effect. I would avoid Central Michigan (only top-100 statistic is passing yards per game) at Miami (OH). If you need any more convincing than what’s been written, I suggest seeking medical attention. Northern Illinois goes to Kent State in a rematch of the MAC Championship last season, so expect more fireworks from the Huskies. Meanwhile Ohio at Akron could be a surprising affair. In the end, the most intriguing match-up will be Eastern Michigan at Buffalo. Buffalo was aggressive against Ohio State in their first half of play in this season, then seemed to fall apart until this past Saturday when they destroyed the Connecticut Huskies 41-12. They’re a streaky team that could produce some surprises or completely fall apart. That’s half the fun of watching them, seeing which Buffalo team shows up on any given day. I expect a close game between two bottom-rung teams in the MAC, but it’s still going to be exciting enough to warrant watching.